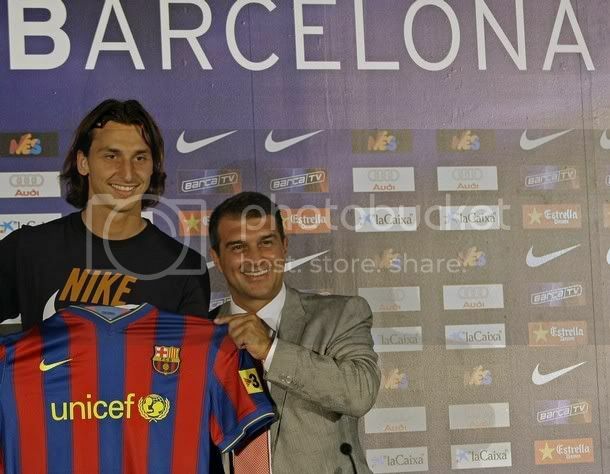 As expected FC Barcelona completed the signing of Ibrahmovic from Inter. Barça will pay 46 million Euros to Inter, as well as Eto’o, valued at 20 million and the loan of Alexander Hleb for a season. If Inter wish to sign the Belarus midfielder after his loan period, they have a first option to buy at 10 million Euros, plus 2 million according to appearances and results. 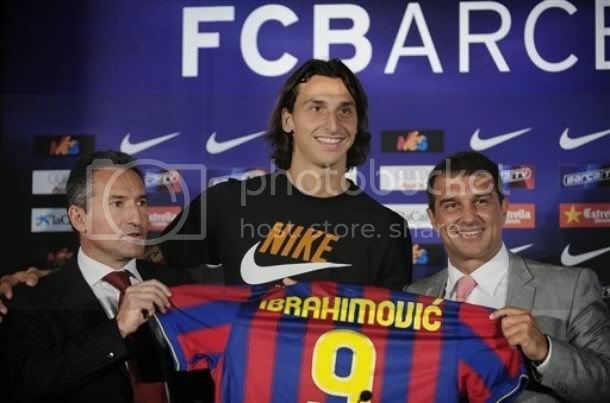 Ibrahmovic meanwhile has signed a five year contract with Barca. Zlatan Ibrahimovic, accompanied by his agent Mino Raiola, signed the contract in Joan Laporta’s office with the President, Txiki Begiristain and club Vice-President Rafael Yuste representing the club.Ibrahimovic’s buy-out clause has been set at 250 million Euros. 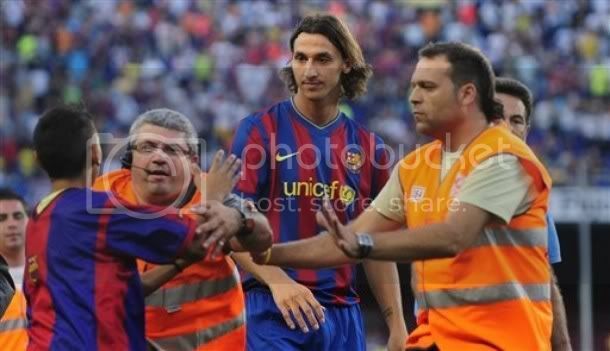 Earlier Ibrahmovic had usual Medical with Camp Nou staff and came through it as all expected. The club doctor's have confirmed that Ibrahmovic has a broken hand. The club doctors said that it’s a break at the base of the second metacarpal on his left hand. Ibrahimovic broke his hand in a friendly against Chelsea last week on Inter’s US Tour. 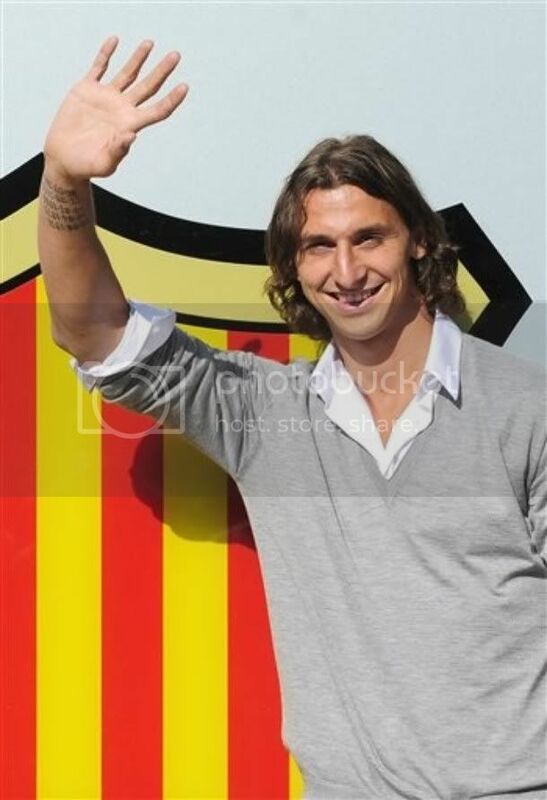 Meanwhile Ibrahmovic appeared very excited on joining FC barcelona. 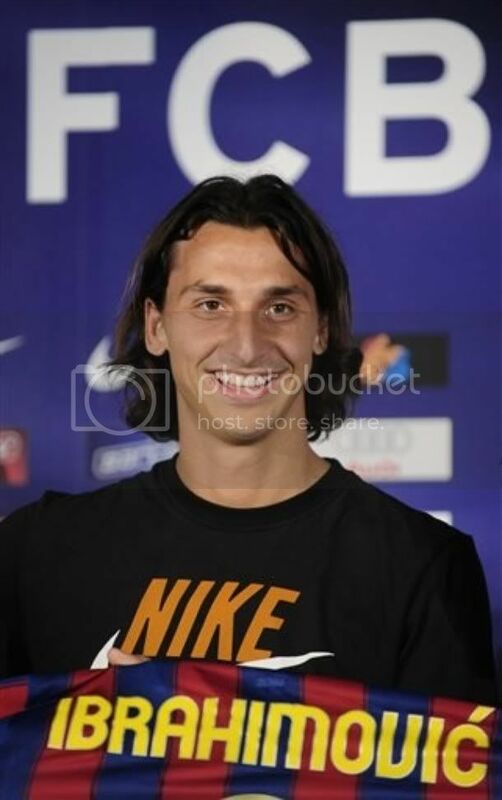 After teh signing Ibrahmovic said and I quote "I am the happiest man in this room right now. 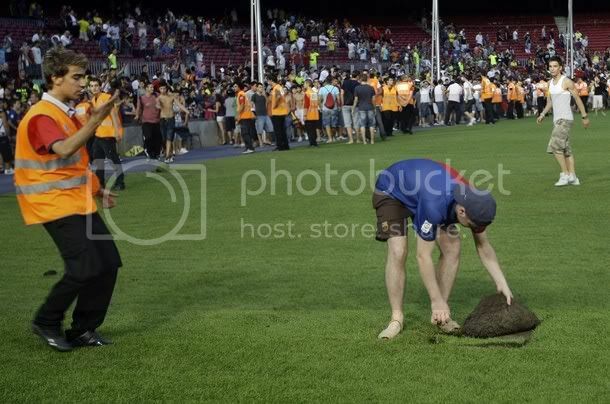 There are big clubs, but none quite this special.” Meanwhile the presentation was cut short due to the fans invading the pitch. 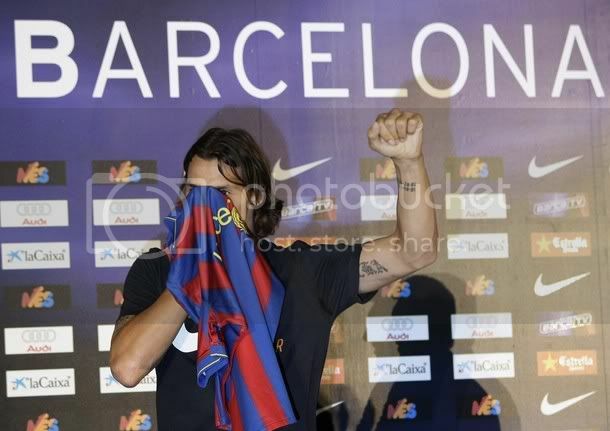 Zlatan Ibrahmovic was presented in front of a 60,000 strong crowd at Camp Nou. 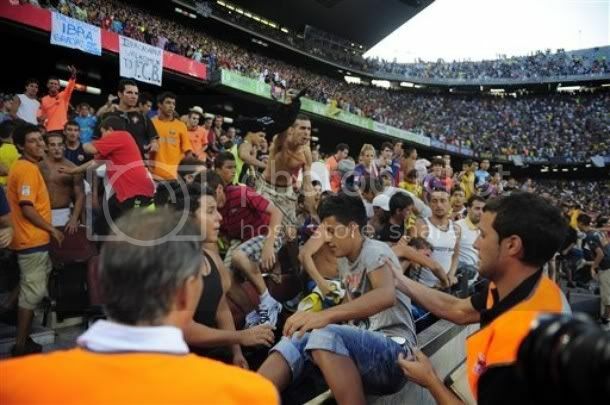 The occasion was marred by fans invading the pitch to get close to their new superstar. 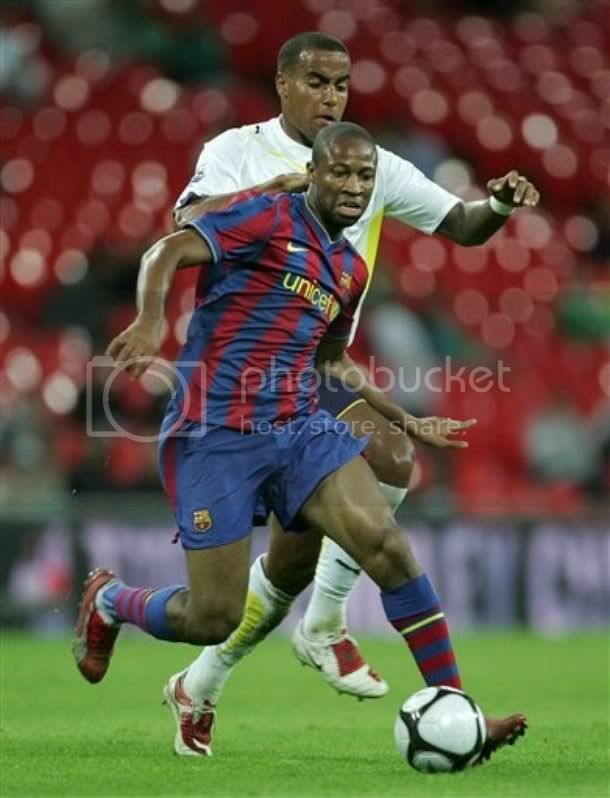 FC Barcelona eased past the challenge post by Al Ahly in their second match of the Wembley cup. The 4-1 victory but wasn't enough for them to grab the inaugral Wembley Cup. Celtic later defeated Totenham 2-0 to claim the first edition of this friendly cup. Like the last match Guardiola put in another young but talented side ofr this encounter. The first half team were Jorquera, Mantoyo, Henrique, Muniesa, Abidal, Victor Sanchez, Rueda, Keita, Rochina, Bojan and Gai Assulin. Predictably GUardiola brought in Messi and Valdes in the second half. The second half team consist of Valdes, Dalmau, Caceres, Fontas, Espasandin, Dos Santos, Toure, Gudjonsen, Pedro, Messi and Jeffren. Al Ahly were destroyed by Celtic in their first match where the final score read 5-0. So it was expected for Barca to get past them with ease. These two matches also showed us that we probably might be having the best Defensive Midfielder in the world in the form of Yaya Toure. 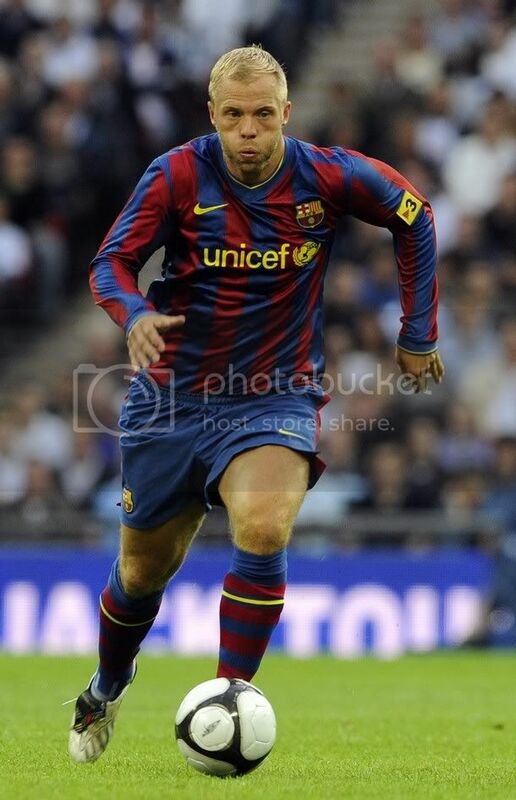 He was the best FC Barcelona player seen in the Wembley tournament. As expected Al Ahly didn't create any trouble for Barca early on. In the 16th minute Rochina won the ball near half line and made a good run forward, he played the ball to Bojan on the left who fired a low shot past the goal keeper from the tightest angle towards the far end of the goal. In normal case that goal should have seen Barca taking more control but Barca appeared sloppy and Al Ahly looked more determined to grab an equaliser. In the 31st minute they grabbed the equaliser through El Egezy. FC Barcelona took the lead back when Rueda sent in a screamer from 30 yards out to the top right corner in the goal. In the 56th minute Jeffren put Barca 3-1 ahead when he latched on to a Pedro cross. And in the 67th minute Pedro completed the tally with a neat finish. 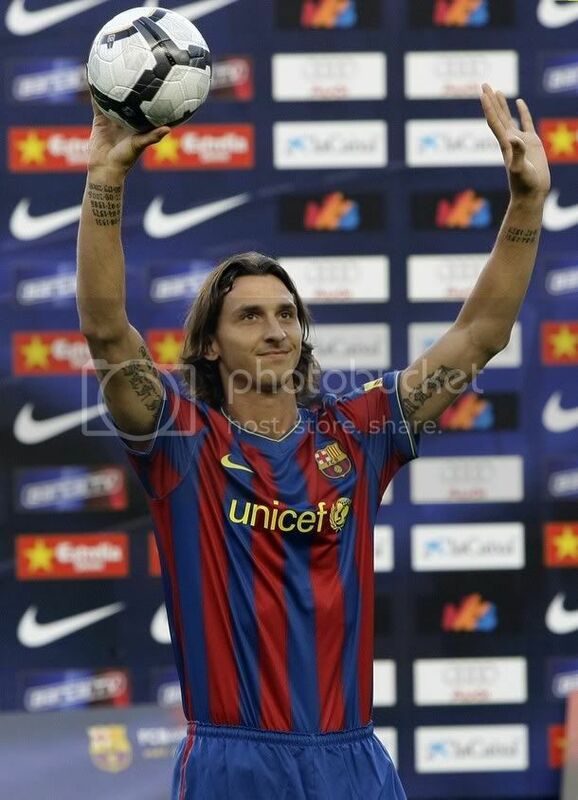 FC Barcelona website has reported that Zlatan Ibrahmovic will be arriving at Barcelona on Sunday for Medical. At the same time FC Barcelona has given permission for Samuel Eto and Hleb to got to Milan for Inter Medical. In the end of the deal the only team which could be smiling has to be Inter as they got a quality striker and a good player plus some around 48 million Euros of cash to play with. It has been a good business for Inter than for Barca. Now Barca has to find immediate cover for other positions especially the position left by Hleb. There is a high chance that Gudjohnsen also will move away and we may need another one more player to fill that position. It is clear we will not be able to fund those transfer from Player sale and we also might have stupidly give more than what was needed to Inter. For me this is one of the most idiotic business done by the club in its history. 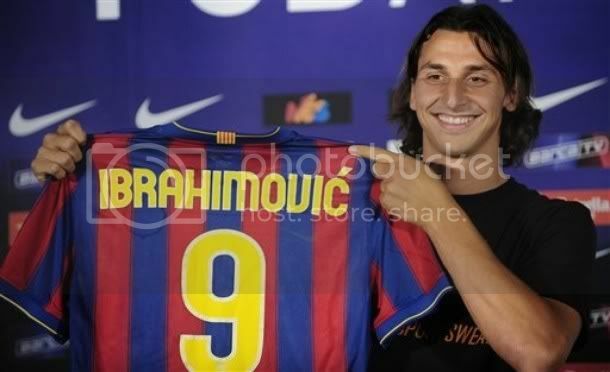 FC barcelona never was a club who use to inflate price but in Ibrahmovic case we have followed the Madrid path. Laporta may deny it but there is no difference between Madrid's huge spending and Barca's this deal. Atleast Kaka and Ronaldo have more star value compared to Ibrahmovic. 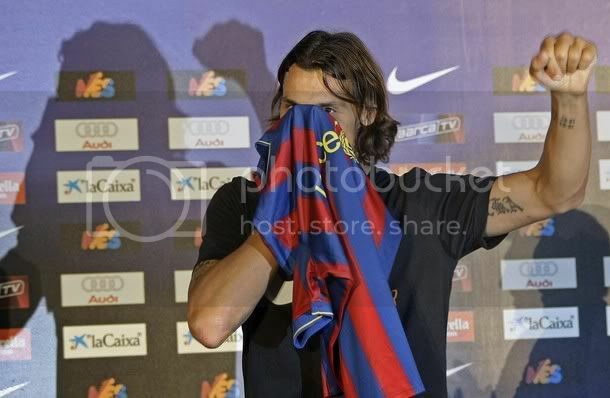 It is also yet to be seen how Ibrahmovic's arrival upset Barca's pay structure. Zlatan was the highest paid star in Europe, but because of lower taxes in Spain he will take a pay cut, but still it will be closer to the likes of Messi (the real superstar of the team). Samuel Eto'o has been one of the most dynamic player in Barca's history. A player who succeeded last season evethough his coach never had a bit of confidence in him. Eto'o has been the outcast in Guardiola's squad last season, but everyone expected the wonderful performance last season might have made Guardiola re-think. But never, Guardiola works with his strange pre-conceptions. "Once an Outcast, Always an Outcast" in Guardiola's books. 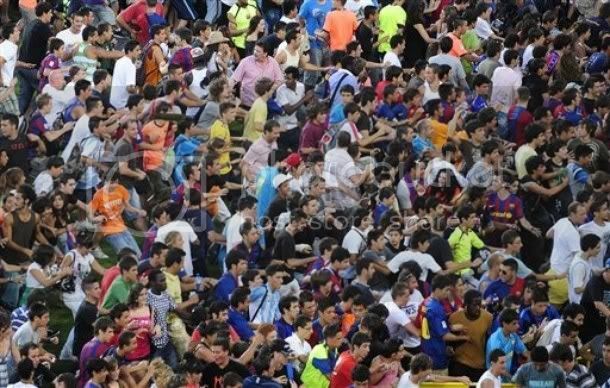 For the last few weeks most of the Barca supporters have ridiculed Eto for not putting club first. Why he should? Will all these fans who point their fingers at Eto put their Company ahead of their job and family. I doubt so. Eto was hired for doing a job; and simply put he did that with perfection. He don't need to see whether Barca made money form his sale, he was hired to score goal. It's plain and simple. 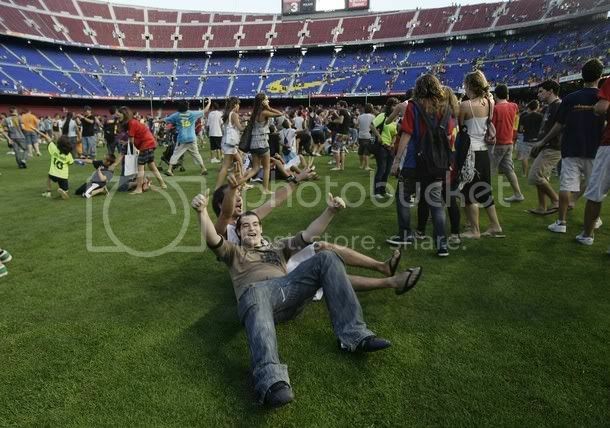 many of these fans forgot that Eto'o has been an essential member in FC barcelona's resurrection in the recent past. He was an essential member in the Rijkaard era and did splendidly well in last season. How many centre-forwards are there, who have a 100% goal scoring record in UEFA Champions League Final. I thought Eto's wonder goal in this year's final turned the tie in favour of us. 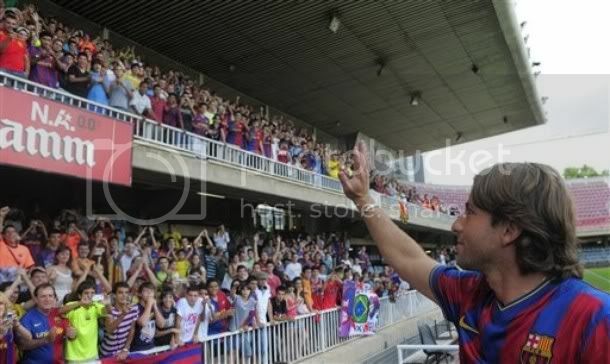 But majority of Barca fans always concentrated on his negative side. Eto is a very dynamic person, he could be a handful in dressing room and is more insecure than any of his team mates. But then traditionally centre-forwards tend to be more insecure than anyone in the team. Everytime Barca is linked with a good centre-forward, Barca fans tend to highlight Eto's personality as a reason for the change. Sure he is a handful in certain situation, especially the tension he created after the criticsm of Ronaldinho in public was very hard to handle. But in the last two years he was very discliplined as far as i am concerned. Maybe Guardiola's treatment could have lighted the spark in him to excel well. And bloody hell he indeed did that. Another fact Eto haters put forward to ridicule him is his inability in air. 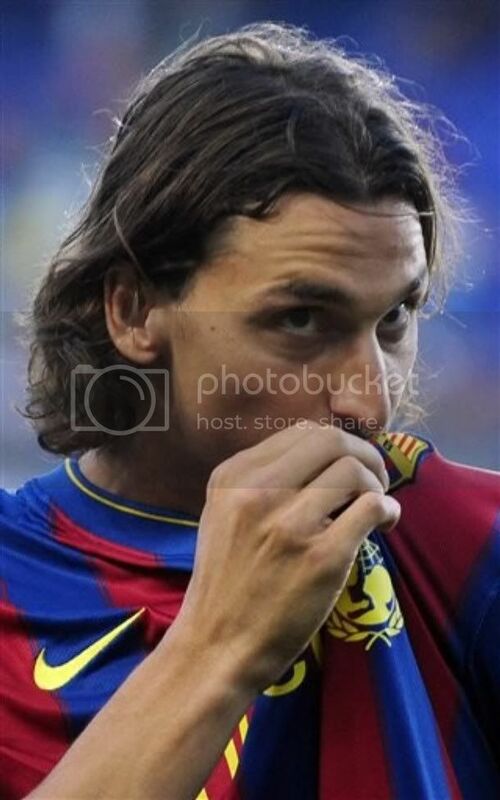 Ibrahmovic maybe better than Eto in air but there is not much of difference between them. 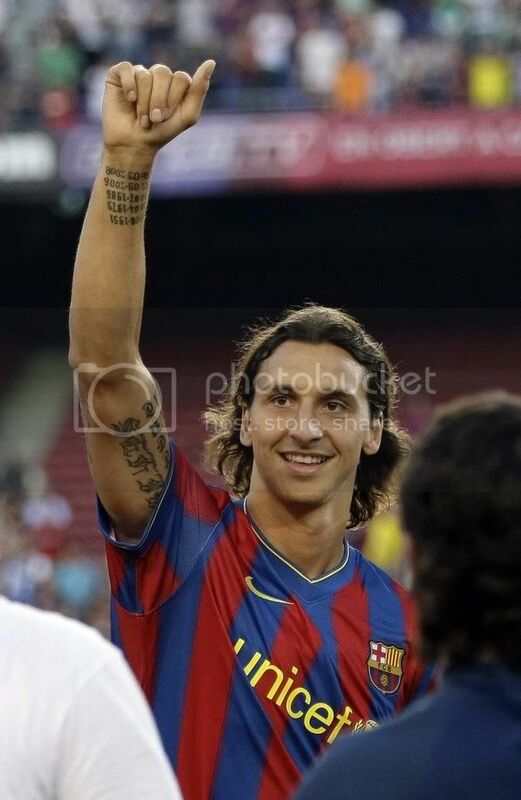 And to all those who thinks that Ibrahmovic is the answer to the "Park the bus mystery", I would say dream harder. The teams which parked the bus against us were Chelsea and Manchester United not some small team. Manchester United played a much iopen game against Inter last season and even then Ibrahmovic couldn't do anything. So it will be too much if we ask Ibrahmovic to solve that mystery for us. In the end this is a good deal for Eto than Barca. For a player it is always better to work with a boss who respect his contribution, and Guardiola does not do that. An under strength FC Barcelona side was held to a 1-1 draw by Totenham in their first pre-season friendly in the Wembley Cup. Bojan Krikic gave FC Barcelona the lead in the 32nd minute but Totenham equalised in the 82nd minute through Livermore's header. Guardiola decided to rest majority of stars from the squad who made it to London. 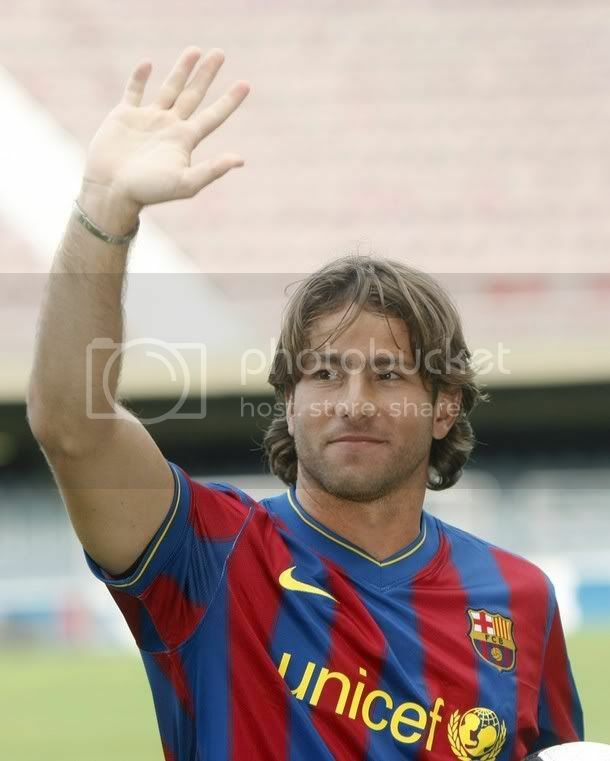 In the first half we featured a team consisting of Jorquera, Montoya, Caceres, Fontás, Abidal, Victor Sanchez, Toure, Gudjohnsen, Pedro, Bojan and Assulin in a 4-3-3 formation. In the second half we put almost a different team with Pinto, Dalmau, Henrique, Muniesa, Espasandin, Johnathon dos Santos, Rueda, Keita, Jeffren, Rochina and Oriol. Considering the strength of teh sides a 1-1 draw in their first pre-season match can be considered as a good result. Totenham started brighter in the initial exchanmge of play, but with time Barca started taking control and looked more organised. In the 17th minute Bojan gets into the edge of box and tries to lob the ball over Totenham Goal Keeper, Cudicini, but was a bit high. Then in the 20th minute Pedro cuts inside from the right and drills a low shot towards the near post but was brilliantly denied by Cudicini. But Barca went desrevingly ahead in the 32nd minute thanks to excellent finish from Bojan after some serious good stuff from Toure. Toure collected the ball just ahead of half line and sets in a fantastic run skipping past defenders; desperate defending from Spurs saw the ball being blocked off Toure in the box but it fell for Bojan who never hesitated in taking the shot. It was indeed a brilliant finish. Then in the 34th minute Gudjohnsen chipped in a great ball into box spotting Pedro's run; Pedro collected the ball and put it past Cudidcini but was wrongly adjudged offside. Then in the 38th minute there was a double scare for Barca when first Modric shot hit bar and then Assou-Ekotto from the rebound had to be punched over by Jorquerra. The first half ended with Cudicini tipping over a great shot from Sanchez from outside the box. Second half saw Totenham trying to impose themselves against a much more weaker Barca side. But they couldn't stop the free passing game of Barca boys. In the 82nd minute Totenham equalised when Livermore heads in a Chimbonda cross. Keirrison da Souza Carneiro has officially become FC Barcelona's second signing this transfer season. FC Barcelona will pay 14 million plus 2 million in incentives to the player's club Palmeiras for the capture of 20 year old sensational. Keirrison will have a medical on Friday before signing his contract with the Club. Even though he is seen as a player with great potential, Barca will most probably loan him out this season. He was born in Dourados, Brazil, the son of an Operário Futebol Clube footballer Adir Carneiro and Alzira Rosa de Souza. His name was chosen by his father, as a tribute to rock musician Jim Morrison from The Doors, and an admiration for the letter K. His older brother is called Kimarrison and his younger Kayon.Keirrison and his father bought a football club from Campo Grande, Mato Grosso do Sul state in April 2008, and renamed it to Centro de Futebol Keirrison, shortened as CFK9. Keirrison started his career with Coritiba. 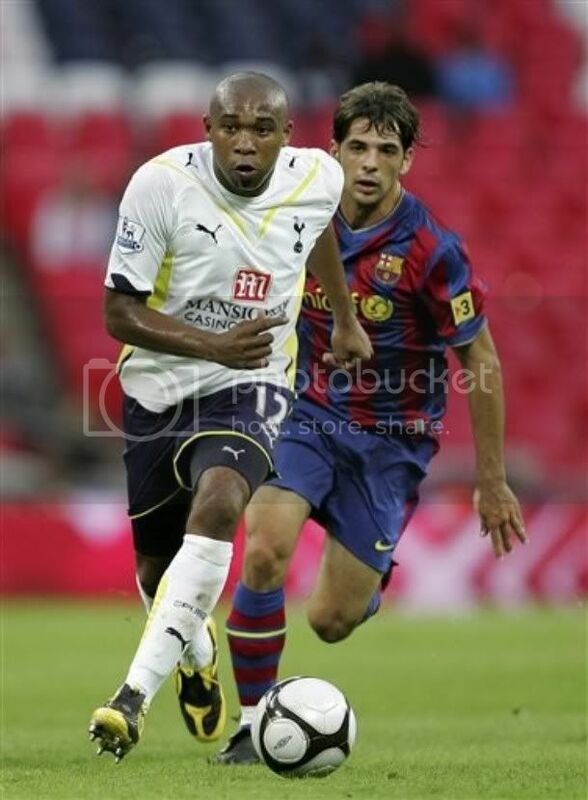 He became a regular in 2007 season helping the team win Campeonato Brasileiro Série B. 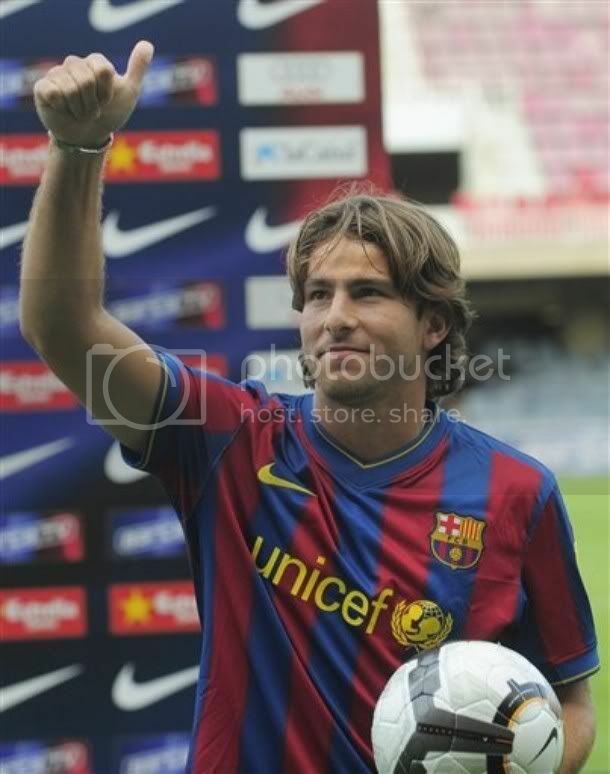 He was the top goal scorer of the Campeonato Paranaense in 2008, with 18 goals. Keirrison joined Palmeiras from Coritiba in January,2009 . 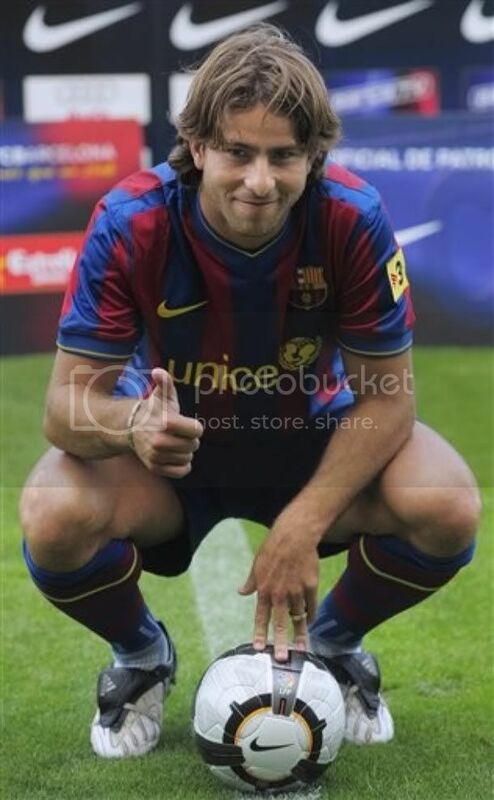 Has Eto Agreed To Leave Barca? Reports are emerging from Spain that Samuel Eto has finally agreed to a 9 million Euro a year deal with Inter. 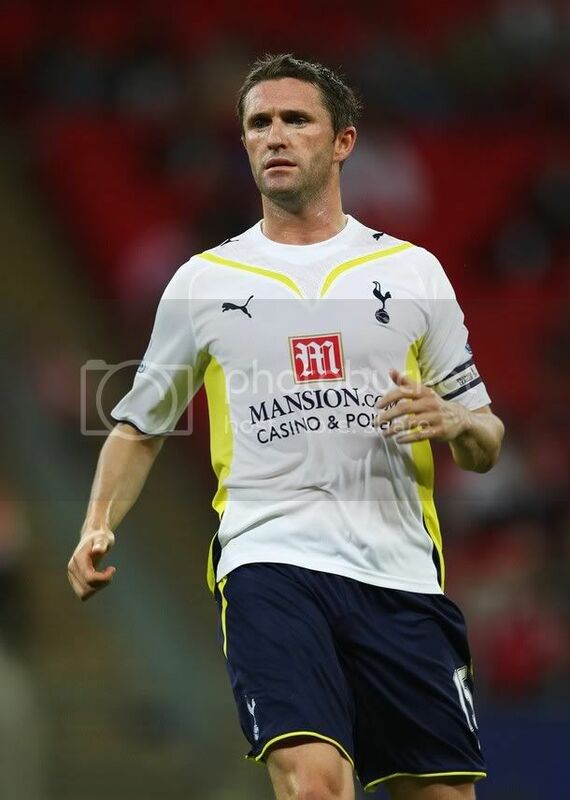 There has been no confirmation from both the clubs but the players agent was recently quoted - that a deal is imminent. The whole saga of Eto - Ibra swap has taken some crazy twists recently. One media report suggested that Barca is ready to scrap the swap agreement and pay 75 million Euros for the Swede striker. 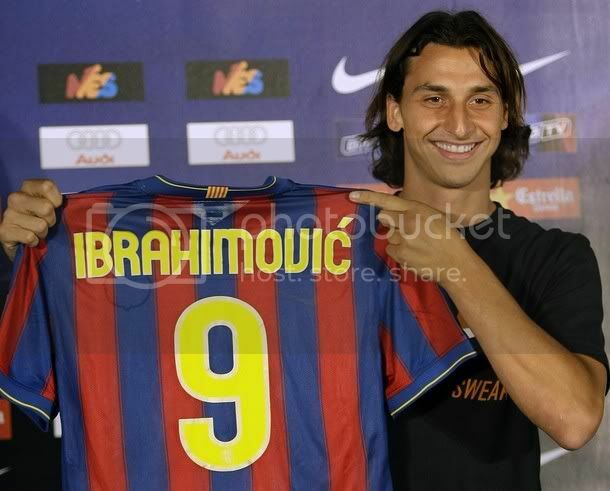 That showed the desperation of Barca management to sign Ibrahmovic. 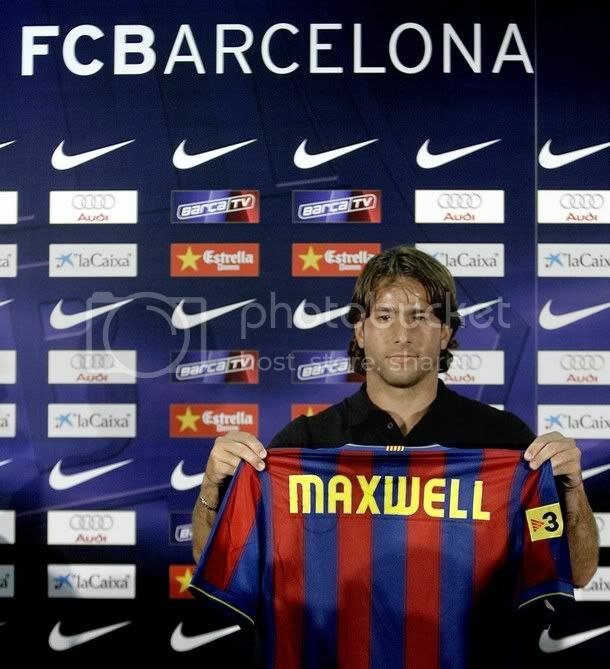 With Eto agreeing to terms, this can be considered as the biggest signing of Barca history (it is still not clear whetehr Hleb is includede in the deal). Laporta earlier this season criticized Real Madrid for their extravaganza and inflation of the transfer market. He also recently defended the Ibra-Eto swap deal as nothing similiar to Madrid's transfer this season. But I am sorry to disagree with Laporta on this. Real Madrid with their purchase of Kaka and Ronaldo inflated the transfer market out of proportion. If the Ibra-Eto deal goes through we will be doing the same. Madrid atleast can justify that they have paid these enormous amount tow former WPOY. We can't even do that. Samuel Eto has been an essential part of Barca's success for all these years - first with Rijkaard and now with Guardiola. 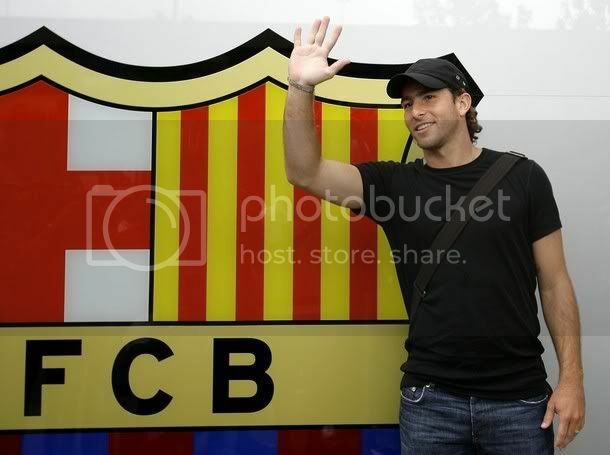 It is not a huge surprise that he scored in both of Barca's triumph in Barca's greatest triumphs till date - the Champions league final in 2006 and 2009. With Eto one thing was guranteed - Goals. Ibrahmovic is a slightly different kind of player but more technically gifted. But he initially has to fit into the 4-3-3 formation we play so well. And with the price tag associated with him he has to score atleast 25 goals in league this season. Now that would be a huge expectation to live with. Many of the people point out that we have to change the team as we have won everything last season and they are firmly behind such a huge move. They all fear that not acting now will repeat the failure of 2006-07 season. But honestly how many of you have recommeneded to have Ronaldinho, Deco and Eto sold out after the 2006 Champions League final triumph? The truth was that Rijkaard lost it completely interms of discipline after that seasona and we basically paid for that. Still this deal could be good but the price of this is cannot be justified. 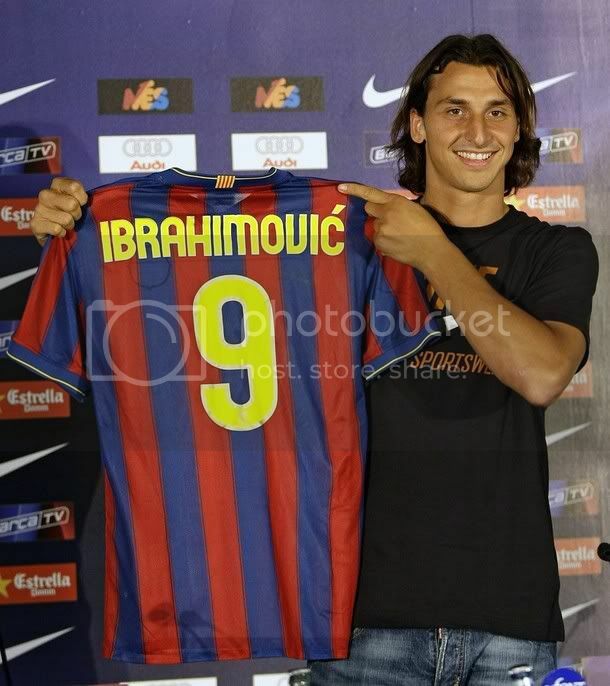 Another statistics that has been put forward to justify this deal was the aerial ability of Ibrahmovic. 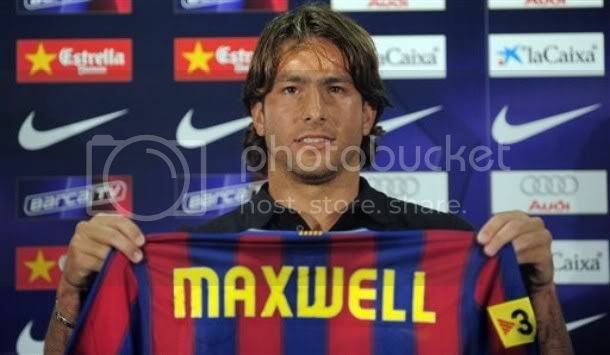 He was billed as Barca's potential answer to the Bus-Parking done by Chelsea this season and ManU a year before. Ibrahmovic is much better than Eto in air but I don't believe that he will be that good agaisnt the Chelsea and Manchester United defense. Last season I have watched the ManU vs Inter match and he looked impotent in that match. Maybe we can hope that maybe a one-off game. But he could be real threat when it comes to free kick. After the departure of Ronaldinho we were quite innefficient in this field and we could add another weapon to it by Ibrahmovic signing. 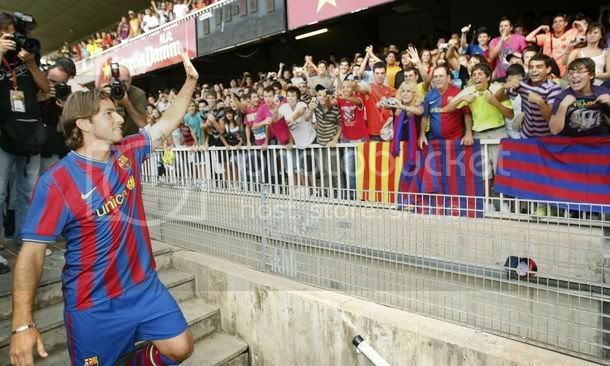 Again then it is yet to be seen whether he will track back to help defense like Eto has done in all his times at Barca. It is quite surprising that Barca fans who yelled out at Madrid's huge signings weeks before is seeing this huge signing in a different angle. They justify this saying that it is essential for FC Barcelona at this point of time. But then it is quite surprising to see them crying foul at Madrid's signing as it was essenitial for Madrid to bring in major players after such a succeful season for their traditiona rivals. 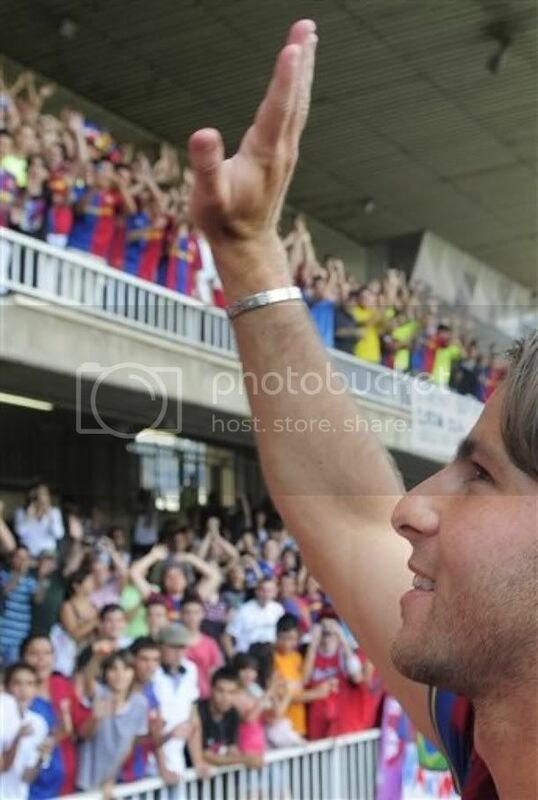 After some long much deserved rest, FC Barcelona has started their pre-season tour. FC Barcelona will be first seen competing in the Wembley Cup against Totenham on friday 24th July. Guardiola has picked a 28 man squad for the trip to London. The squad contains 17 from senior squad and 11 from the youth and reserve teams. 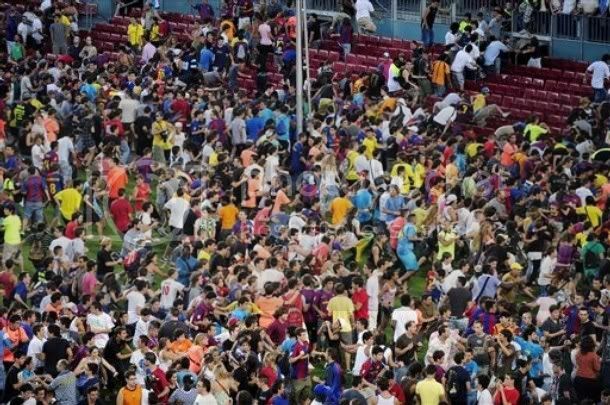 The squad list include Valdés, Pinto, Jorquera, Martín Cáceres, Víctor Sánchez, Henrique, Maxwell, Márquez, Abidal, Keita, Touré, Gudjohnsen, Hleb, Bojan, Henry, Messi, Pedro, Oriol, Dalmau, Montoya, Fontàs, Muniesa, Espasandín, Rueda, Santos, Jeffren, Rochina and Gai. Puyol, Xavi, Iniesta, Piqué, Busquets, Alves, Milito and Eto'o has been excluded from the squad and will only join mostly for the pre-season in US. It will be good to see how we cope the absence of two of our genius creative midfielders - Iniesta and xavi. Most probably Messi will be wearing the captain's armband. Meanwhile Manchester City has been confirmed as the rival for FC Barcelona in the Joan Gamper Trophy match. The match will be held on the 19th of August at Camp Nou. Mean while there is no clarity about the Eto-Ibra deal. It seems like Eto's asking price of 12 million dollar a year is the road block for the swap. Is Guardiola That Good a Manager? This is something which has gone through my head a thousand times. Is Guardiola that good a coach as he is been featured by media? 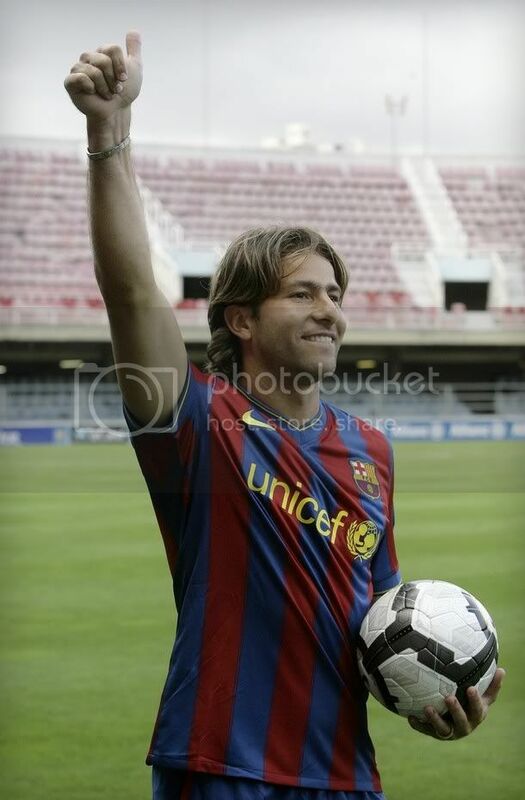 Surely a guy who has won an unprecedented treble with this FC Barcelona side has to be good, but is he a legend. For me Guardiola at this moment is more of a disciplinary genius than a tactical one. Many may disagree pointing to the was he switched Messi inside in the Champions League final. But to be honest that game was all about blunders Ferguson made than the tactics employed by Guardiola. To Guardiola's credit he managed very well with the resources at his hand. Now many may ask whether Guardiola had no part in the success of last season, surely he had - maybe the largest part. He brought something which the Barca setup was lacking for the last two seasons - discipline. In Rijkaard's last two season there were no doubts about the fact that he was never in control. 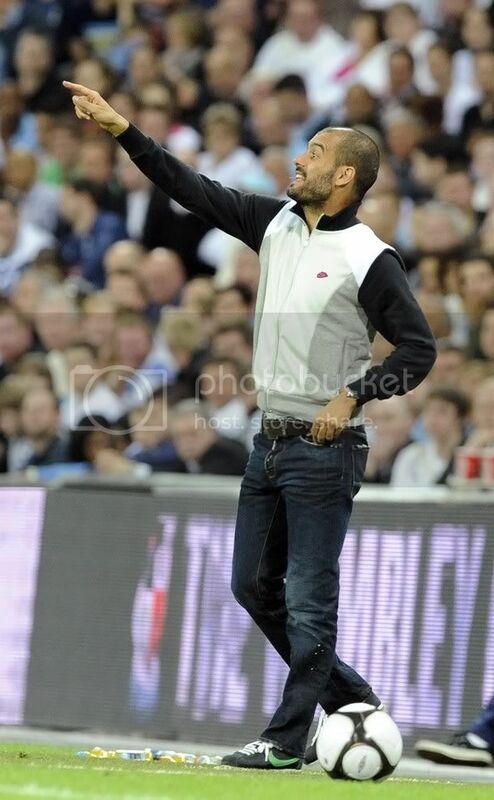 Guardiola came out with an iron hand approach and did kept a complete control on the proceedings. No one was able to take their place for granted and that proved one more point thing - FC barcelona had two bad season because Barca was playing bad, not because of others playing well. But to all his credit Guardiola is not a tactical genius. He has been out-thought by Hiddink and looked lost till that dramatic turn-out in the injury time. Actually that was one battle we had trouble dealing last season. The same was with the way we played at Atletico Madrid. His reluctance to use substitutes to change the course of match was very irritating. Many a times we saw he holding back substitutes to be used as a time wasting tactic. The prime example was the Sylvinho substitution against Chelsea, don't call it a master piece, I thought he forgot we had a substitute left. More over he looks like a guy who comes with a lot of pre-conception. His reluctance to accept that Toure was the best defensive midfielder we had was a prime example of that. The way he handled Eto saga earlier last season showed his inexperience and reluctance to accept ground reality. And it looks like he has not learn from that also. 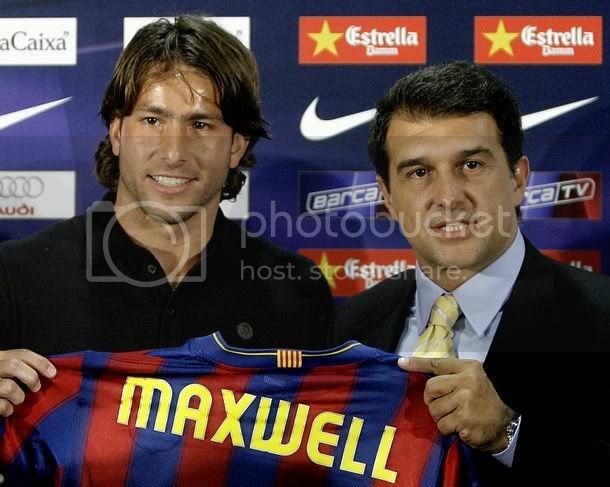 Under him and Laporta, we successfully managed to unsettle Eto again without any proper back-up assurance. Strangely now every egg lies in Eto's basket. He can decide to stay in Barca for one more season and leave for free at the end of it, if he stays we will be forced to use him as a striker this season. Guardiola and Laporta went ahead with upsetting him without really taking ground reality of signing a replacement in account. Now mostly we have to cough up a much higer value to land Ibrahmovic, that again depends on Eto agreeing to Inter's terms. But it might be too early to judge him. He is in his second season as a coach and will probably improve with more experience. He has all the making of becoming a good disciplined coach but I doubt whether he will be able to mold himself into a tactical genius. In FC Barcelona he is the ideal man as we always play a very attacking style and we need a guy to hold the team's discipline intact. But I would love to see him using his brain a bit more in transfer market. The Hleb saga was a disaster in making from the beginning. And we still have not addressed the left side issue. If he is planning to use Iniesta upfront more, that also could backfire as that will deprive us of the service of the best attacking midfielder in the middle. Without Iniesta it is easy for teams to double mark Xavi and take him out of the equation, we had seen it many times last season. I believe this could be the make or break season for Guardiola as a coach. There was not much pressure last season but that success means there will be more and he will be scruitinized in every step he take. Joan Laporta has confirmed yesterday that the club has agreed on principle with Inter about a deal which will see Zlatan Ibrahmovic moving to Barcelona for exchange of Eto and some cash. There are rumours flying in plenty for sometime and the latest rumours suggests that Barca will give 40 million plus the service of both Eto and Hleb on loan. No deal will be reached if Eto does not agree to the terms which will be put infront by Inter. Already there is rumours that Eto is asking for 10 million a year from Inter and at this moment that looks like the only hope for me preventing Barca commit this colossal mistake. Last week we saw FC Barcelona disagreeing on Valencia's asking price for Villa, which was supposed to be in 50 millions. But now it looks like we might get Ibrahmovic, a player who goes missing in big matches for a value of 80 million (40 million in cash + Eto and Hleb). 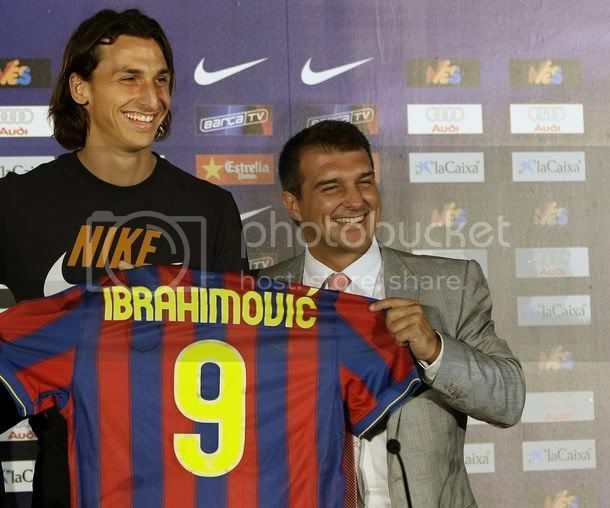 The big question is - Is Ibrahmovic worth that money? Absolutely not. 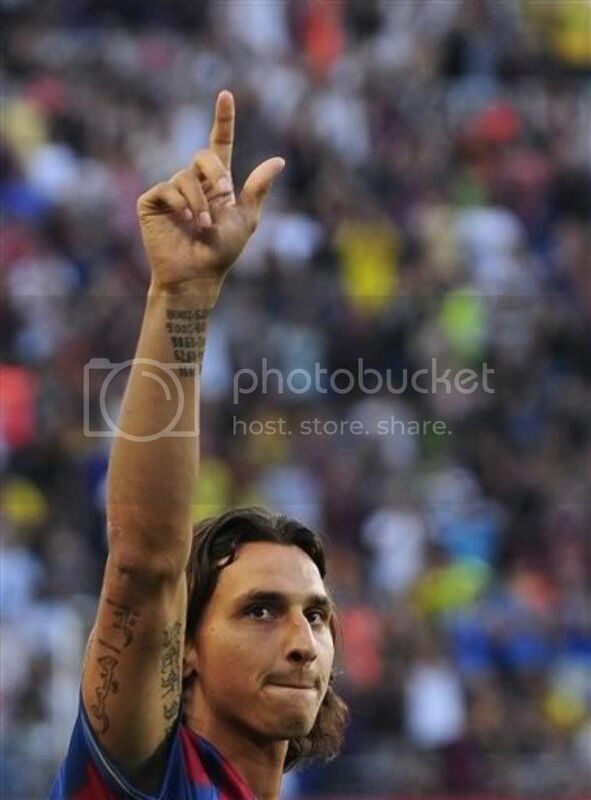 Ibrahmovic is one of the top quality striker around Europe and has been successful in recent past. But he has not yet performed what Eto did for Barca, scoring goal that too in plenty. Nor did he has done something Kaka or Ronaldo performed - taking their team to European Glory. So at this moment looks like Barca is going to perform another collosal blunder in terms of monetary valuation by signing Ibrahmovic for this amount. This blunder looks much more horrifying when considering the fact that we could buy Villa by adding a 10 million more to our earlier bid. David Villa is a proven customer and is sure to succeed in FC Barcelona as he is the best to fit our style of play. Secindly he is not a striker who goes missing against big teams. Ibrahmovic sadly always have quiet game against bigger teams, last season Champions League encounter against Manchester United was a plum example. He looked like a striker who was making his debut, fully out of confidence. 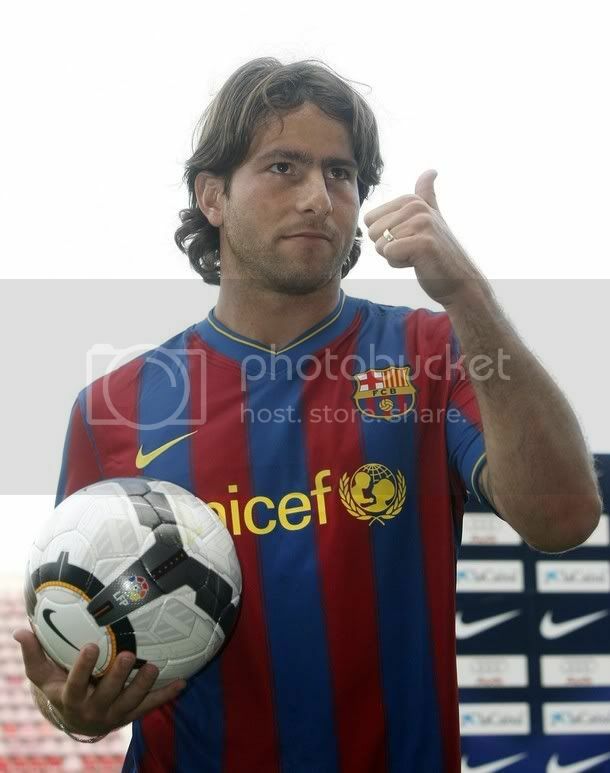 But again we have to ask why Laporta is going for the striker at this huge price? This one potentially has all the making of being another Hleb signing. 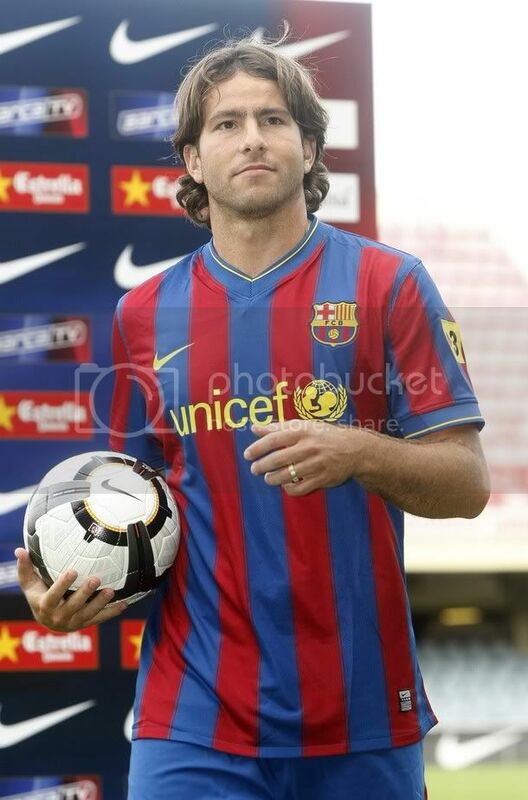 Last season Laporta and Guardiola circled on Hleb to replace Ronaldinho. We know where that went. Now the same team is going to get rid of two players and 40 million to sign Ibrahmovic. Crazy indeed and now all the hopes lies on Eto. Guardiola's tactic for the next season looks similiar to the one he had last season. He will try playing Henry and Ibrahmovic at centre-forward position with Iniesta moving forward on the left (that is why he is giving Hleb's service for free). That will leave the midfiled with a combination of Xavi, Toure and Keita in most matches. We saw last season what happens when Iniesta moves out of that midfield. But Guardiola looks like he will never learn. 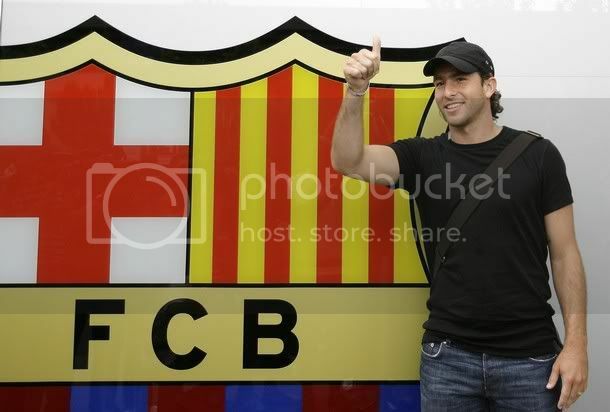 Here are pictures from Maxwell Scherrer Cabelino's presentation at Mini Estadi at Barcelona on 17th July 2009.